Improve sales and search for entrepreneurs based on the parameters of your own choice. 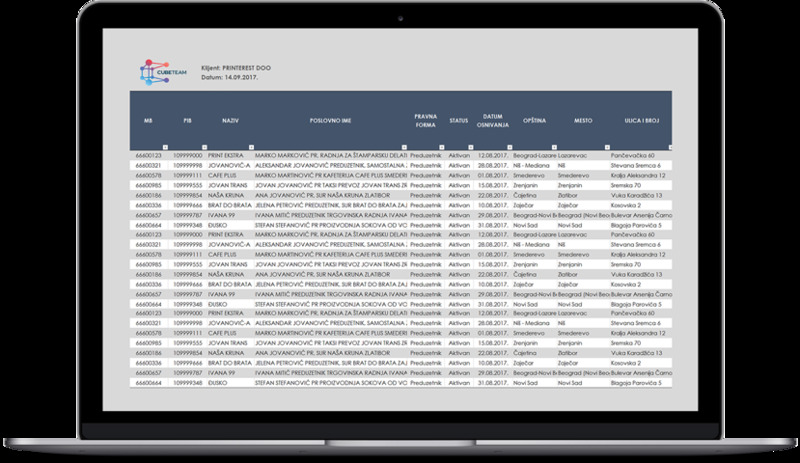 Create a business database of clients that meet your standards, monitor the best companies in Serbia, as well as businesses with frozen accounts. Compare the data and set clear business goals. The business database is easy to use and presents a necessary tool for any company that wants to increase sales. Find the best companies in Serbia, new customers or suppliers, quickly acquire newly opened companies and see the size of a selected market segment. Then, make an adequate sales plan based on acquired data, with a reduction in costs and time. There is a large selection of criteria by which the base of potential clients is defined. They include: number of employees, operating income, financial result, region, and country of origin of the representatives. Which will be used to create the database, is entirely up to you. Be efficient with your resources and find customers who are dedicated to your product or service.